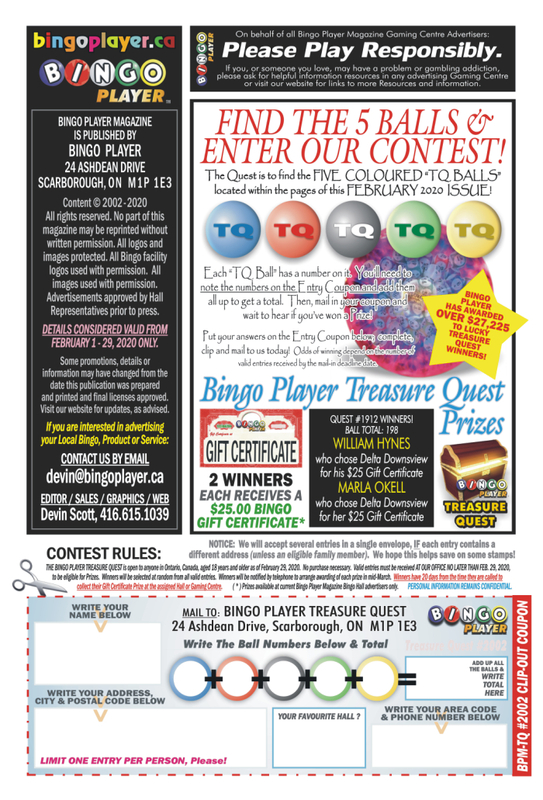 Our monthly Bingo Player “Treasure Quest” contest is now posted here. We are also working to be able to have Readers enter online in the near future, as well as entering by snail mail. We understand, with the ever-rising prices of a stamp, that entering online could be helpful and allow more people to enter. Please be patient while we work to achieve this goal. MORE INFO BELOW THE IMAGE. Right click on the image above and select “Save Image As…”. Then you can print off a copy, trim the ENTRY FORM and mail it to our office. NOTE: For the current “Treasure Quest” Contest, we are allowing for multiple entries to be mailed in a single envelope. The only condition is that EACH ENTRY must have a different Entrant’s Name and a different Mailing Address. Winners will be notified by telephone mid-month (around the 20th).